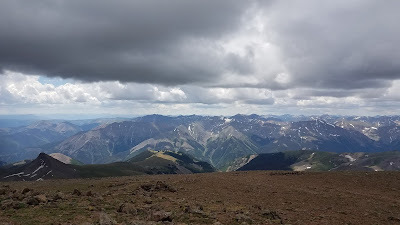 Since beginning the 14ers in 1991 I have enjoyed in recent years making returns to the hikes done in those early years now so long ago. 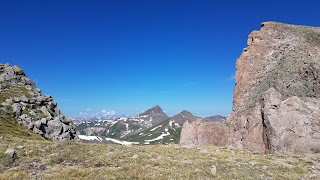 Uncompahgre Peak was just my 3rd 14er summit back in 1992. There are large parts of the hike I don't remember including the beautiful hike into the upper meadows. I do remember the cliffy plateau nature of the summit area and the precipitous drops off the north side. Our 1992 hike was especially unique in that we were involved in the rescue of a hiker who had had an accident. I was hiking with my brother, father and Uncle. As we approached the summit a hiker came up from behind us. They had noticed my uncle had a radio antenna sticking out from his pack and asked if we could help. They had been ascending a steep slope west from one of Uncompahgre's saddles and a girl in their group had an accident. I can't remember if it was a rock falling or if she simply feel and hurt herself. My uncle helped coordinate via HAM radio with one of the county sheriff's and eventually a helicopter was brought in to help extricate the hurt climber. We spent quite a lot of time up on the saddle of Uncompahgre that year. Now it was my turn to bring my own kids back to this beautiful mountain. 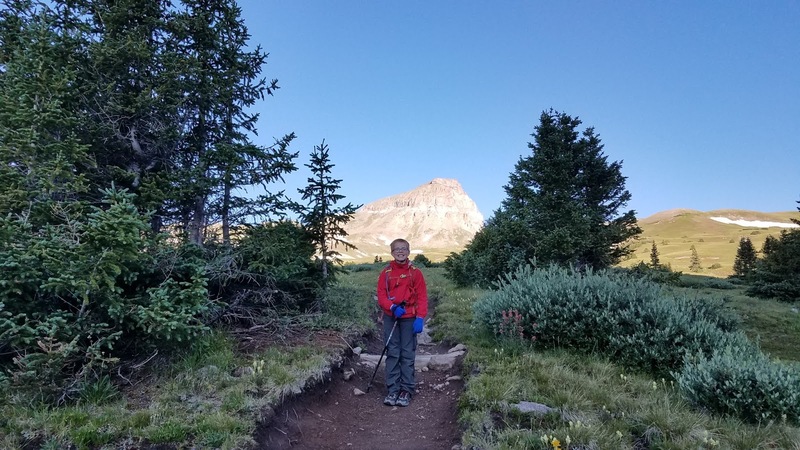 The basic specs of it are reasonable and we envisioned a relatively easier hike for my 3 boys. We also had the benefit of my father's F250 truck to make the drive up the Nellie Creek road. He had been doing his homework again on the road along with his memories of 25 years ago and it seemed reasonable. We left our camper trailer up at Gunnison and made the early morning drive down to Lake City without incident. The dirt country road to Nellie Creek also went smoothly. The Nellie Creek 4WD road was slow going! It was about as rocky as a road can get. None of the rocks were dangerously large enough to make life difficult in the F250, but it sure was bumpy. The road was fairly narrow the whole way with not a lot of places to pass another vehicle. A couple switchbacks were tight enough that we had to reserve and adjust a few times to get through them. The two stream crossings on the road were fairly easily passable in the truck, though they still were at least a foot deep or more. We finally made the trailhead at 6:40am. There were a handful of other vehicles and people camping there. At the trailhead Jonah was already dealing with a headache and some motion sickness from the road, the other two boys seemed to be doing alright. Seth was just glad to be out of the car after the long ride. 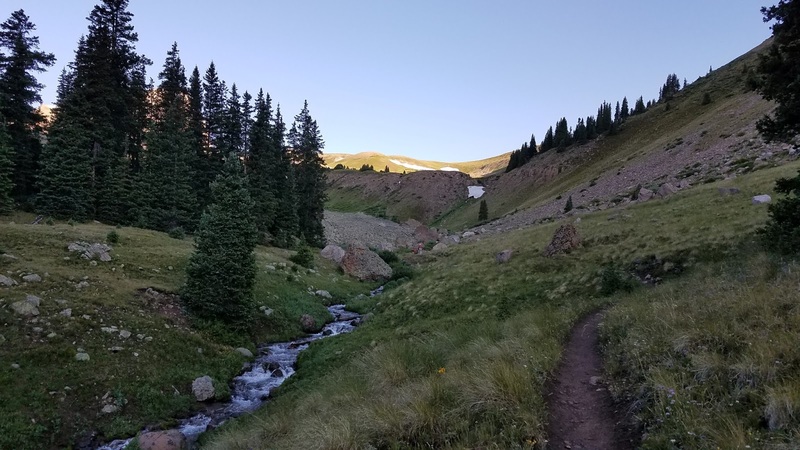 The first half mile of the hike is in the trees and follows closely to the very pleasant Nellie Creek. The trail gains some elevation but it didn't feel overly steep. After leaving the trees the trail goes through a single switchback to gain a hill leading up and above the creek. This puts the hiker into the upper meadows below Uncompahgre. Its just simply beautiful up here. Its all grassy tundra and wildflowers. 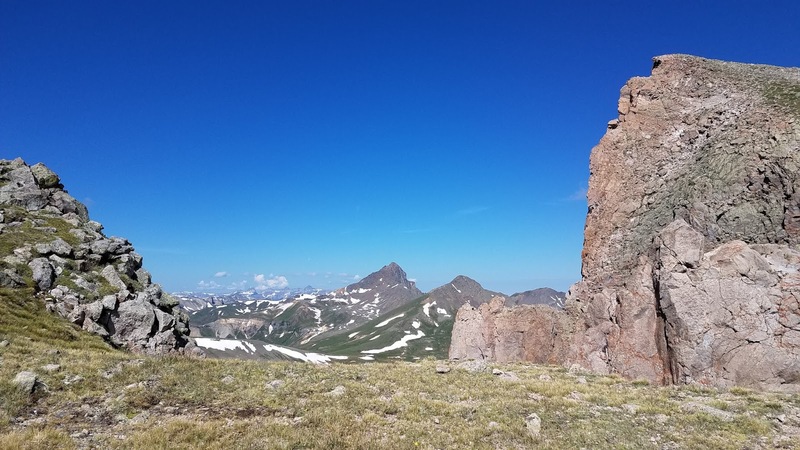 It reminded me quickly of Uncompahgre's neighbor Wetterhorn and the gorgeous hiking we had in there. 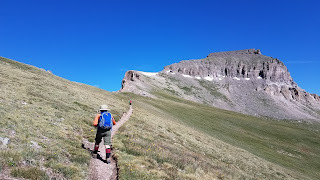 The trail makes a line directly towards Uncompahgre up until about 2 miles in from the trailhead. The views of the peak are clear the whole time. This particular day we had clear blue skies up to this point. The boys were all doing fairly well so far and I was making sure they were continuing to drink and eat a bit. Luke had only been at altitude for 24 hours and he was doing surprisingly well. 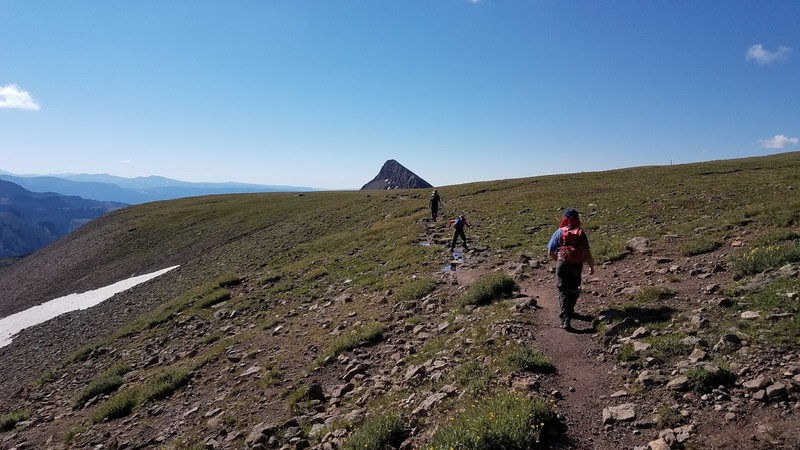 At 2 miles in and 12,700 or so in elevation the trail made a southward left turn to begin to ascend the easiest path up to Uncompahgre's summit plateau. 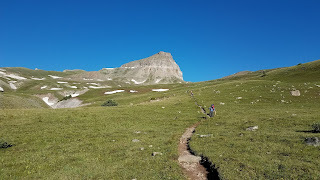 The trail with a few switchbacks, and a melted out snowcrossing gains a ridge far to the southeast of the summit. We passed the sign marking the junction with the Matterhorn Creek trail. This trail could be used to link up to the approach to Wetterhorn or other beautiful parts of the backcountry. 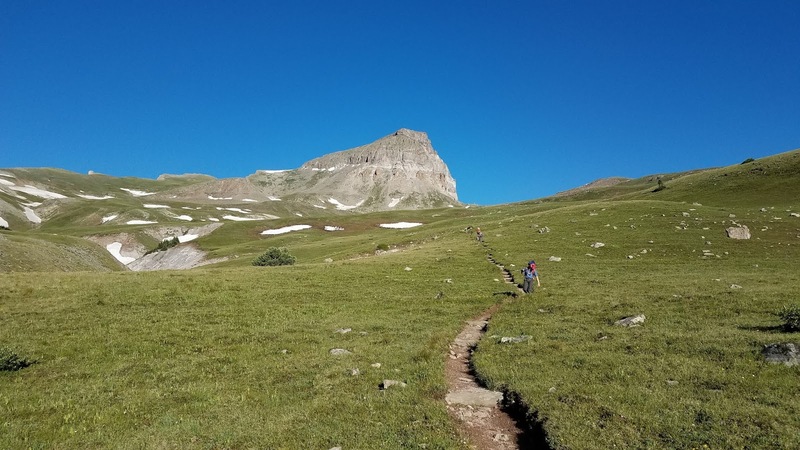 Many fit climbers will link up both Wetterhorn and Uncompahgre using this trail. After gaining the ridge the trail ascends a steep slope mostly hugging the east side of the ridge and eventually gains a low saddle around 13,300 where the views open up to the beautiful San Juans to the west. The trail moves around another bump on the ridge to the main saddle at 13,430. This is the saddle where we spent much of our time in 1992 awaiting the rescue. The views here are also spectacular. We could look down the rock slope from there and see how some climbers would be tempted to climb it. It probably would only be rated class 2+ but it was full of loose rock and still hazardous. At this point we could see clouds starting to build up. I also had two somewhat tiring boys in Jonah and Seth. They were also looking ahead to the steep slope that awaited us. We knew we had a workout still to go. Seth was also starting to eye the cliff band that guards Uncompahgre's summit plateau and I could sense this building on his nerves. The slope ahead has a few sweeping switchbacks and in just over 3 tenths of a mile it gains over 400 feet. About halfway through this section Seth just lost it. We got to the corner of a switchback and he stopped and wanted to go down. 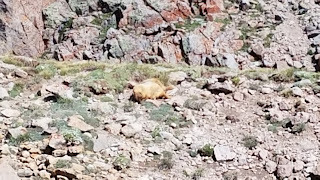 He could see the clouds building and was still eyeing the cliffy terrain near us. He knew my father and I had discussed the weather a bit and he already has fears of thunderstorms and tornadoes and such. I told him I wasn't taking him down yet. If we stopped we would stand and wait where we were for the others. Even if it meant waiting there more than an hour. The weather was holding enough it was still safe for the others to proceed. I sent Jonah forward with Luke and my father and they continued to climb to the top of the slope. Eventually I got Seth to move forward again though I could see his nerves were at an edge. We gain the top of the slope where the base of the cliff bands meet the south ridge. I knew the most difficult terrain lay ahead based on route photos I'd studied but I expected the terrain to be fairly easy rock scree to ascend, nothing more. When I got my first hand look I knew I was in for trouble with Seth. The terrain was still safely passable for us but he wasn't going to like the look of it at all. We had the cliff band to our right while moving through safe but narrow terrain. We then reached a loose rock gully which was fairly steep. It wasn't class 3 terrain yet but it was getting close to the high end of difficulty for class 2. The other 3 in our group were doing well ascending it, having only stopped to let another group go around as rock fall in this area was a concern. Seth lost it again and just stopped completely. His nerves were frayed with the modest amount of exposure we had encountered. I told the others to continue to ascend and I would stay with Seth and possibly take him down to the high saddle to wait them out. Time was beginning to be a concern for us as our ascent was now over 4 hours in and the clouds continue to build. I was hopeful the other three would get to summit, my chances were slim as I stayed with Seth. Just as I was ready to start taking him down, on his own, he began to slowly move upward in the terrain again. I started holding his hand as he was losing confidence in his own footing. We found a path to slowly ascend the loose dirt and rock while hugging the edge of the rock cliff for handholds. 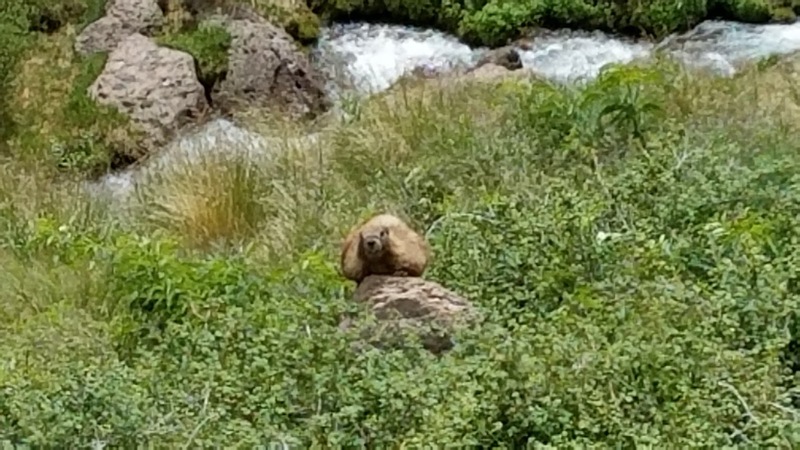 He asked a couple times if we also had to descend this time, I had to tell him yes. I was happy on one hand, that as a smart hiker, he was fully aware that a climber needs to be able to descend what he ascends. But I could also sense he knew the descent of this terrain was going to be a challenge. I comforted him and said I would be with him every step, I would help him down. At the top of the loose gulley we climbed through a cleft in the rocks and found Jonah had stopped to wait for us there. 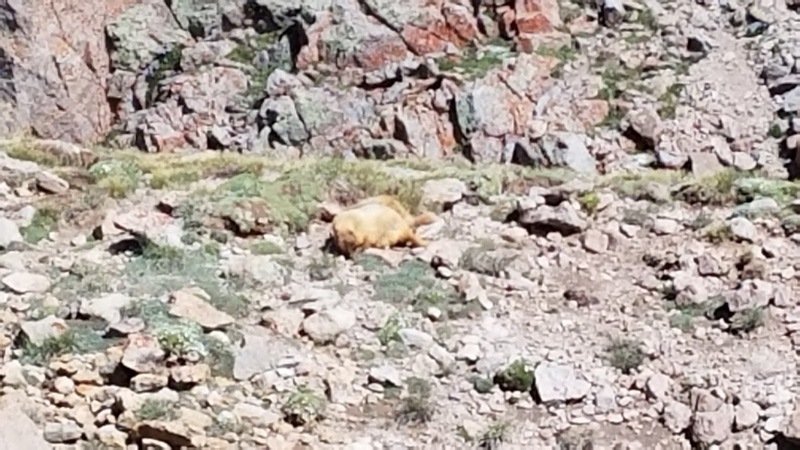 This surprised me as he was by himself in difficult terrain. If we had turned around he wouldn't have summited and would have been solo for who knows how long. So we grabbed him and proceeded forward. Much to our dismay as we continued onward I fully realized that the summit plateau is larger than I thought. I had to continue to coax Seth forward now as the summit was in sight but it was still more minutes and effort away. There was another short ascent through a switchback high on the plateau, though no further immediate exposure at this point. In that switchback Dad and Luke were beginning to descend and wait for us. 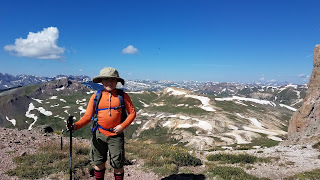 Seth got to near the top of the switchback now with the true summit in sight. Jonah and I moved ahead and made the high point for a few moments. 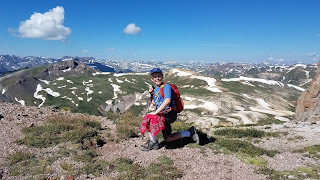 Seth, while on the summit plateau, didn't proceed further with us to the high point. I only took a few minutes for pictures because of the imposing clouds. I didn't even stop to eat anything. Jonah and I headed down and grabbed Seth with us. We made our way back to the top of the rock gully and I sent Jonah down ahead of me, but with instructions to stay close. Seth got into the gully and froze again. He could clearly sense the exposure below us and really just couldn't handle it. Jonah descended really well on his own and frankly I didn't have to worry about him at all other than to keep him in sight. I held Seth's hand and I would face in on the slope and move ahead of him slightly so I could then hold him and help him through every steep down step. With him having lost confidence in his footing it actually made it harder for him as he wasn't using the grip on his shoes well and so wasn't finding good traction. As I got him about halfway down I could see finally his confidence was building. Knowing I was in front of him and helping him every step he started to make good decisions and moves on his own. It was rewarding to see him start to realize he was going to be okay. As we neared the bottom of the gully we started to get a few sprinkles. We were glad to be out of it without the rocks getting wet on us. 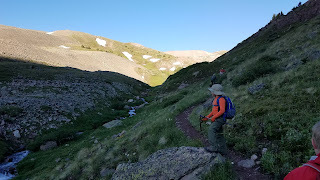 When we got back to the upper saddle above the steep grass slope we caught up a bit with my father and Luke. The weather was fairly imposing at this point. 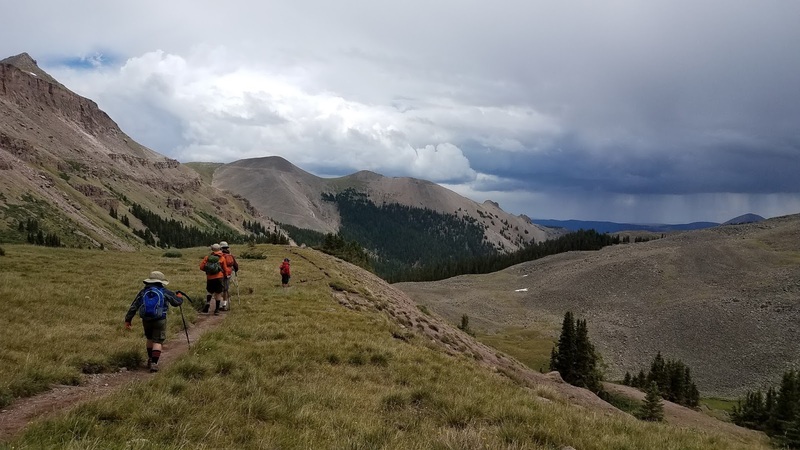 We had heard thunder in the area and with my three boys on the edge of a ridge I was indeed anxious to get to lower ground. There was a light rain coming down and temps had cooled so we were all getting our rain jackets and light gloves on. I did everything I could to keep the boys moving. My father and Luke held a pace out ahead of us other three. Thankfully Seth was mostly calmed down now, despite the weather, and was hiking a bit better. I knew I had normal Seth mostly back when he was now more concerned with the typical kid question "how much farther do we have to go!" 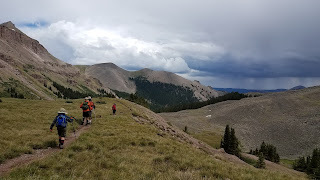 When we got down from the south ridge and into the upper meadows the rain had mostly stopped and it felt like the weather was loosening its grip on us. 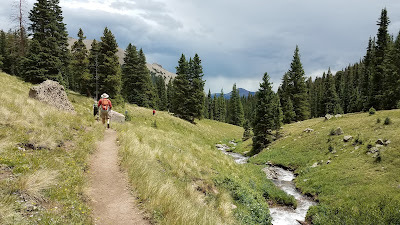 We were all together again on the trail and got into a nice pace of hiking out and still enjoying the beautiful scenery. As usual, the boys were all good hikers on the downhill and seemed to get better the closer to the trailhead we made it. We almost had a bit of sun poking out by the time we made it to the car. It was 2:20pm when we finally finished. We had a 4:39 ascent today and a 2:47 descent. The ascent definitely took longer than anticipated but we are glad that we made it safely.